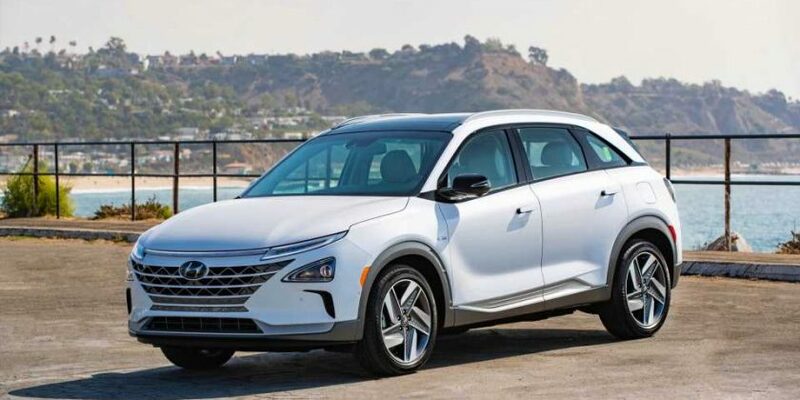 The hydrogen-powered 2019 Hyundai Nexo is the replacement for the Tucson Fuel Cell, and like its predecessor, the Nexo will only be available at a handful of California dealers. In a statement, Hyundai said California sales of the Nexo would begin before the end of 2018. Hyundai said the Nexo will initially be available in southern California at Keyes Hyundai in Van Nuys, and Tustin Hyundai located in its namesake city. Capitol Hyundai, which is located further north in the San Francisco Bay Area, will begin selling the fuel-cell vehicle in 2019, Hyundai said. Sales of hydrogen cars continue to be limited by a lack of fueling stations. The network of stations has only recently begun to expand outside California, so Hyundai and other automakers are playing it safe in order to ensure customers don’t get stuck too far away from a place to fill up. The Nexo’s two competitors, the Toyota Mirai and Honda Clarity Fuel Cell, are also sold only in California. Hyundai claims the Nexo will achieve a range of 380 miles in efficiency-focused Blue trim. That beats the outgoing Tucson Fuel Cell’s 265 miles, and the 366-mile and 312-mile EPA-rated ranges of the Clarity Fuel Cell and Mirai, respectively. However, the Nexo Limited trim level has a reduced range of 354 miles. The Nexo has 161 horsepower and 291 pound-feet of torque, which can get it from zero-to-60 mph in 9.5 seconds, according to Hyundai. Hyundai is taking an “all of the above” approach to reducing emissions. In addition to launching the Nexo, the Korean automaker plans to deploy hydrogen fuel-cell trucks in Switzerland. But its lineup also features hybrid, plug-in hybrid, and battery-electric models. Hyundai plans to introduce 38 new or redesigned green cars by 2025, likely including models for its Kia and Genesis brands.